ROME (CNS) — Chaldean Bishop Antoine Audo of Aleppo, Syria, and his people are exhausted. The bishop, who is president of the church’s charitable agency, Caritas Syria, left the country for a few days to attend the general assembly of Caritas Internationalis in Rome May 12-17. Daily life “is becoming more and more difficult and tiring,” he told Catholic News Service. When the fighting first began in 2011, he said, the people of Aleppo held up well because the danger zones were far away. 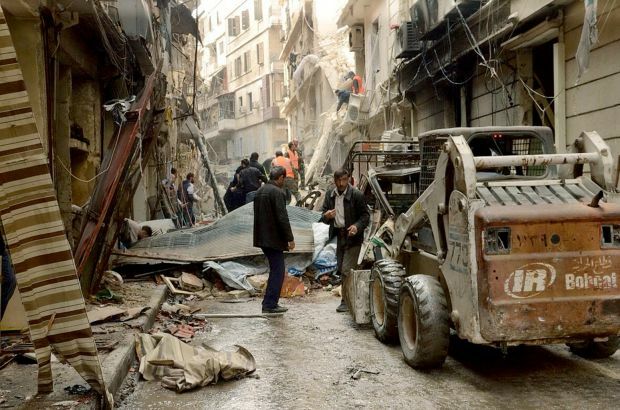 “Something like 80 percent of people in Aleppo are without jobs. So they don’t have any money to survive,” the bishop said. “We have everyday bombings,” he said. “I can have a bomb on my street, my cathedral, my bishopric, on the schools. We don’t know why and where,” but it happens every day. “Those incidents spread trouble and fear, and the Christians living in Aleppo” are trying even more desperately to immigrate to the West, he said. “This is really something very sad for us” since Christians have been present in Syria since the time of the apostles, he added. Almost everyone would leave if they could, he said. Caritas offers a variety of programs, including distributing or delivering food, providing education and medical care, supporting elderly people and helping the displaced find shelter.